Are you looking for an awesome girl’s night in party theme? If so, I have the perfect suggestion for you and it happens to follow suit with a hot trend in the adult relaxation world! 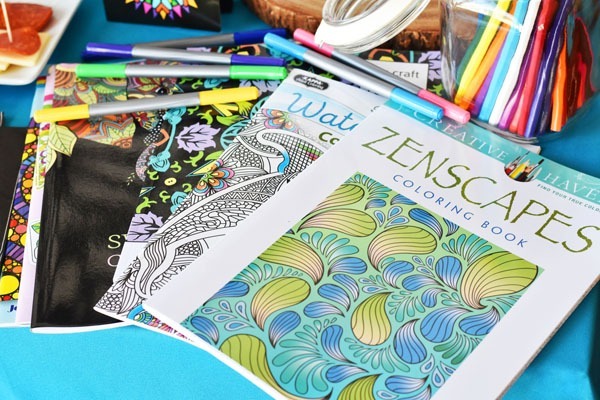 How about an adult coloring book party? Ok, so maybe you chuckled to yourself but seriously, all my adult girlfriends are loving this relaxing past time that helps you to exercise your creative outlets all while chit chatting, and enjoying some snacks, and drinks! So my adult coloring book party was set up for 3-4 adults. 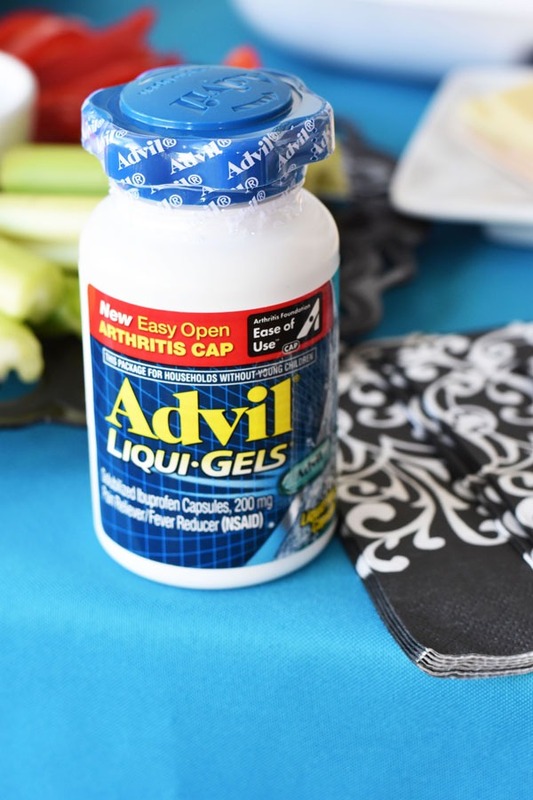 Since many of them are starting to suffer from arthritis (hello office work jobs), and headaches I made sure to have a bottle of Advil Liqui-Gels EZ Open. 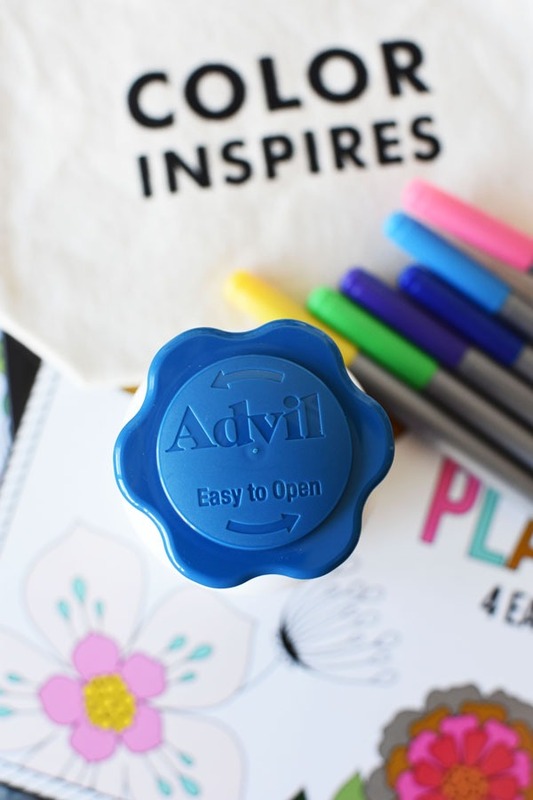 This bottle cap is easier to open for people with Arthritis (verses other child-proof varieties of Advil). However, you will want to keep it up, up, and away from children since it is so easy to twist off. For us folks with achy hands, and joints it is a lifesaver! I purchased a large bottle from Walmart along with some snack ingredients for our party. Speaking of arthritis, today actually happens to be World Arthritis Day (October 12th). Ok, now back to the party! So this was so fun for me to set up because I actually have always loved to color! I was always that child who would win the coloring contests so I thought it would fun to have prizes for the best coloring page! 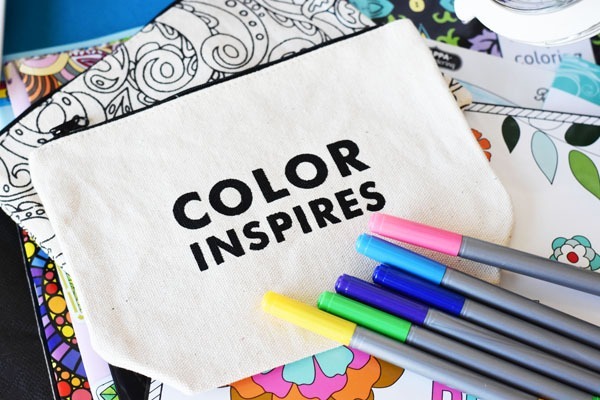 I bought some “color yourself” pouches, and a decorative set of colored pencils for the winner(s). I displayed those on the table among other things. 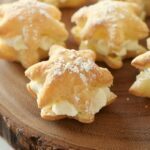 Now onto some fun party hosting tips! Consider painting basic mason jars with chalk paint to add some snazz to your tabletop. Washi tape is also a great choice and can take a mason jar from drab to fab quickly. Cloth table cloths work best and look nicer. To get the wrinkles out, pop them in the dryer on perm press for 5 mins. For drinks, I always serve water first and save the good stuff for the kitchen-wink, wink. 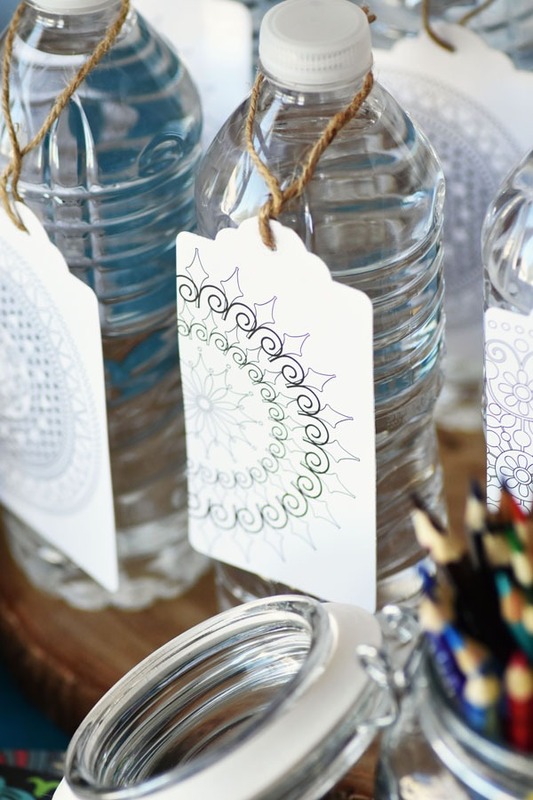 I decorated my water bottles with coloring books tags for added effect and removed the store-bought labels. 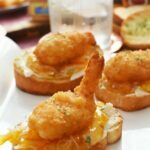 Appetizers should always be things that do not require heating and are inexpensive and quick to put together. 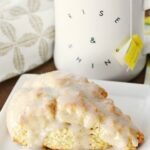 The cottage cheese cucumber cupcakes were a no-brainer and cane be made by slicing cucumbers into 2 inch chunks, gently coring out the middles and adding a dollop of cottage cheese, and half a cherry tomato to the top. 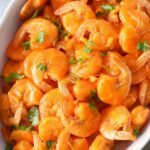 A veggie tray was also a great choice, and can be prepared ahead of time. 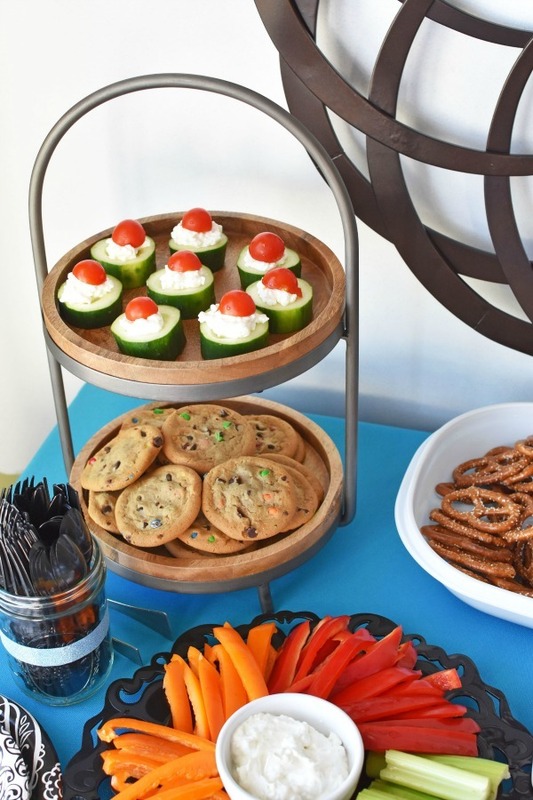 No party is complete without some sort of chips and dip, or something sweet. I opted for a slightly healthier version by using sour dough pretzels to pair with french onion dip. Rainbow cookies were also ideal because well,…this is a colorful party after all! 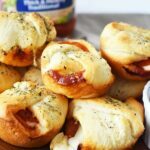 Cheese and pepperoni are also a great choice and so easy to set up. Don’t forget the toothpicks. I purchased an assortment of adult coloring books on Amazon and got quite a few for my money. I also bought some coloring book place mats which can be colored, and then laminated. 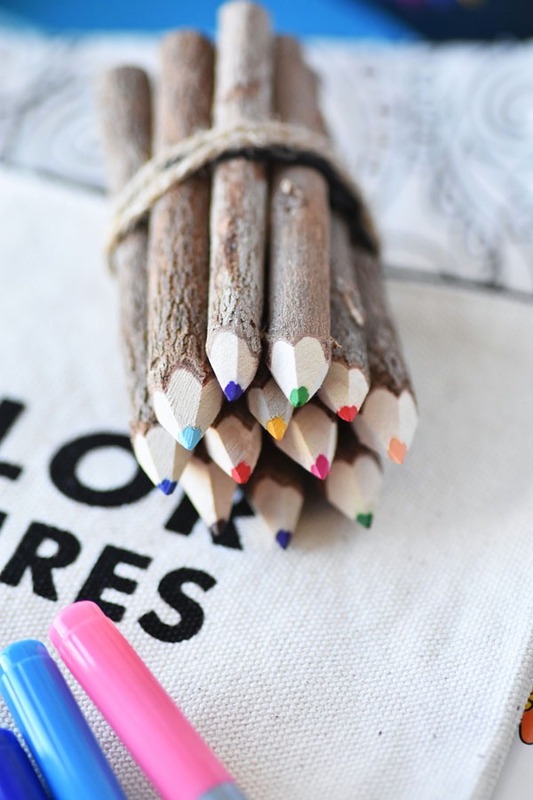 Colored pencils, gel pens, and markers are a must for adult coloring. I purchased an assortment to fit everyone’s preference for coloring. Lastly, for the paper ware, I found the cutest black and white paisley design. I think it is a great choice to tie the theme together. 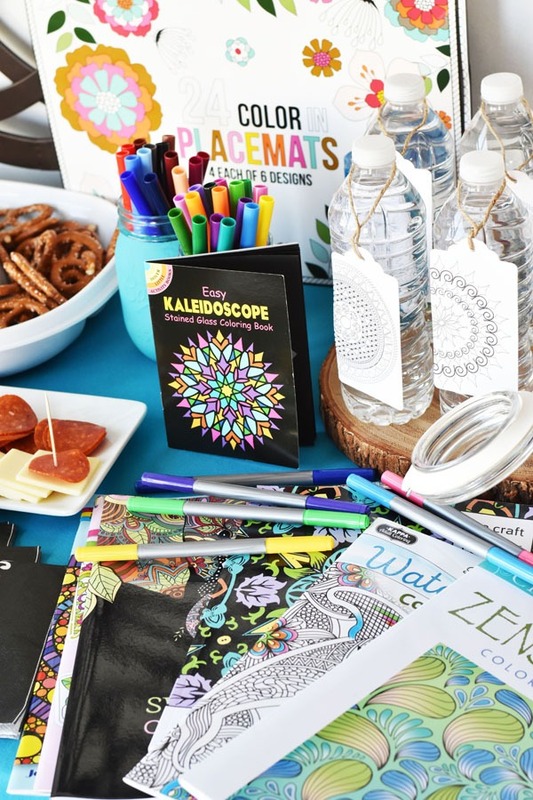 I really love how this adult coloring party came together and know it will make for hours spent with good company. 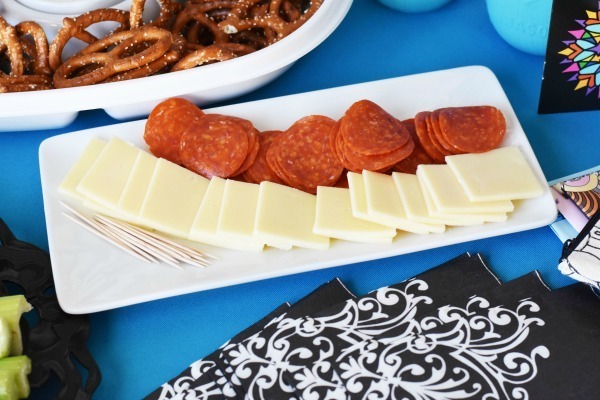 Consider a party like this for your next girl’s night in fun. Don’t forget the Advil EZ Open Bottles either! You never know who will need some to cope with any arthritis pain in their hands! 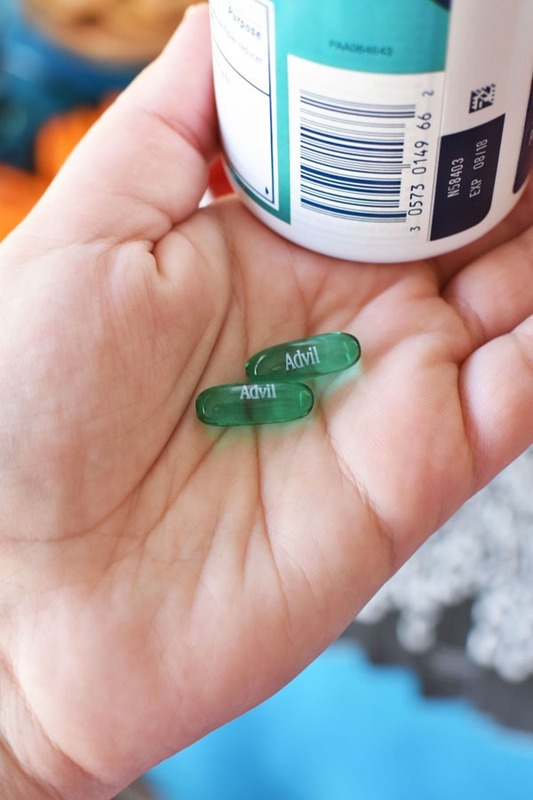 Get your Advil Better Living Toolkit here. *US residents only. I have never bought a adult color book. They definitely do look like they would be relaxing! I could use something to destress myself. It would be fun to do this with friends for sure. I have always liked to color… did it while pregnant years ago. and as a senior citizen I still like it. I bought several adult color books at Dollar tree and one at wal-mart, It is fun. I have some pages I only do a little coloring on as i am actually working on finishing a page. for me coloring is fun and relaxing especially when tv is not good and you are tired of cleaning and doing other housework. I am always looking for ideas to do a get together. 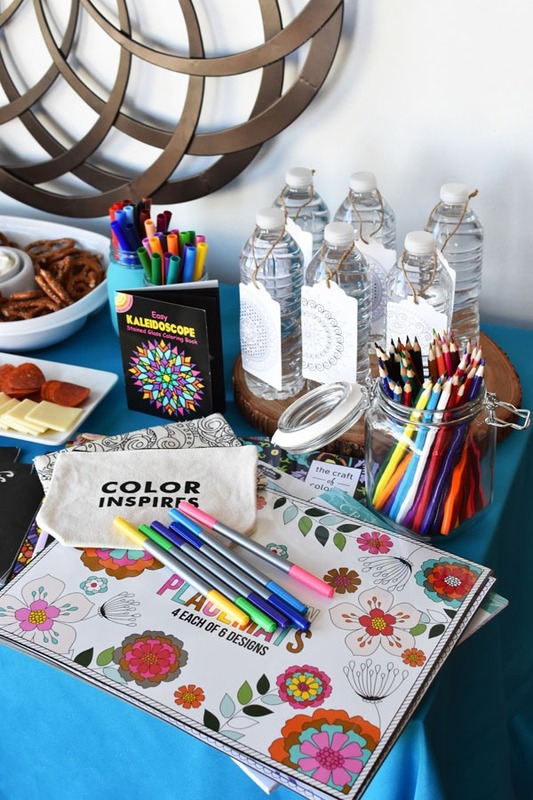 A coloring party is a fantastic idea. I will have to start planning it out now. This looks like a great setup. I love to color in my adult coloring books. It is so relaxing for me. 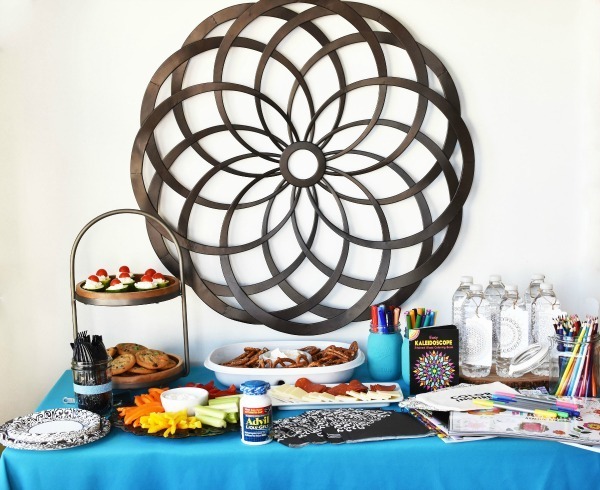 What a great spread you have put together for this type of get-together. I am a huge fan of adult coloring books – the artwork is always so intricate and mesmerizing! Ok first this party sounds like so much fun! I actually love coloring! And advil is my go to all the time, my house is always stocked! This would be so relaxing for a party theme. I haven’t colored since college, but it sure looks fun and yay for arthritis relief! What a cool idea! Back in law school I used to color at night (unfortunately adult coloring books didn’t exist back then) and it was a huge stress reliever. 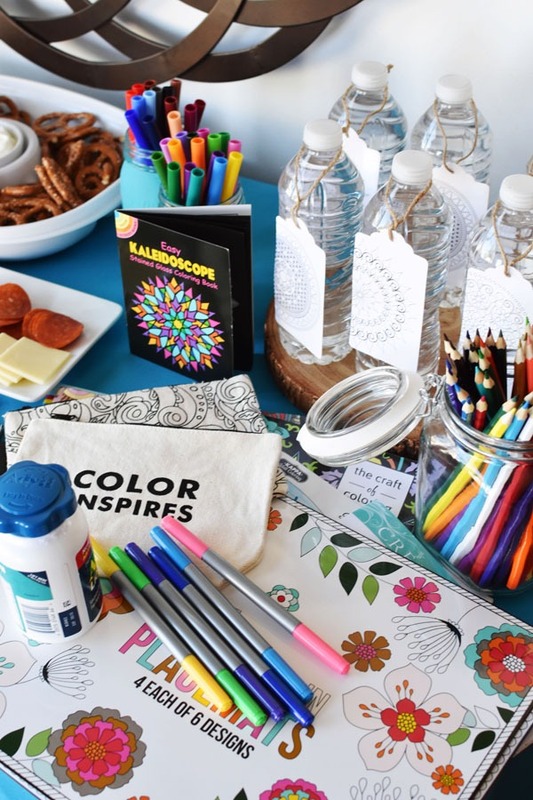 I love the idea of a coloring party! This is my kind of party! Between the coloring books and the food i’d come over and stay for hours! And — honestly -ADVIL makes everything feel better. Oh my goodness! I love to color. And I love these ideas! I am having myself a coloring party! This would be great for a party theme. I love my coloring book, it’s so relaxing. Okay, those colored pencils are amazing! 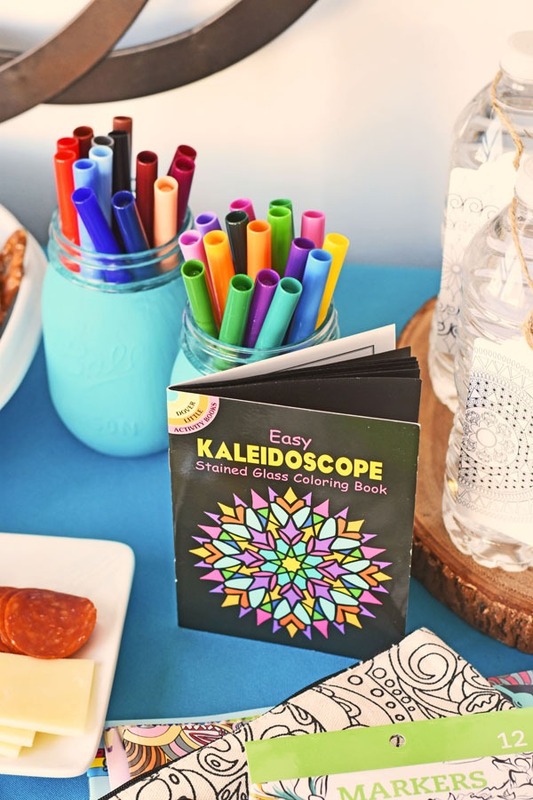 Love adult coloring books, what a fun party idea. I’ve never done adult coloring books. But I know they are so popular right now and your post has convinced me to give it a try as a way to relax after a hard day at work. Both my husband and I enjoy using adult coloring books to relax. You have done some neat things with them here. I love parties and getting people together! Looks like a great idea. I have never been able to just sit down and color from one of those books yet. I need to try it though! OOOH! This looks like so much fun! I’ve been meaning to try the adult coloring books. These are great ideas! What a great idea for a day with your friends! I want to have a party like this. 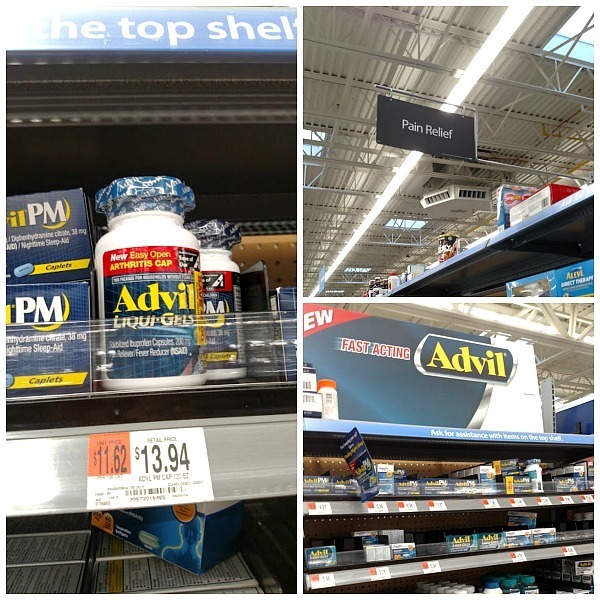 Advil is my go to pain reliever too.